After a summer at TechChange, it’s time for Sean Bae to start his first year at the University of Maryland-College Park this fall where he is considering a major in Electrical Engineering. 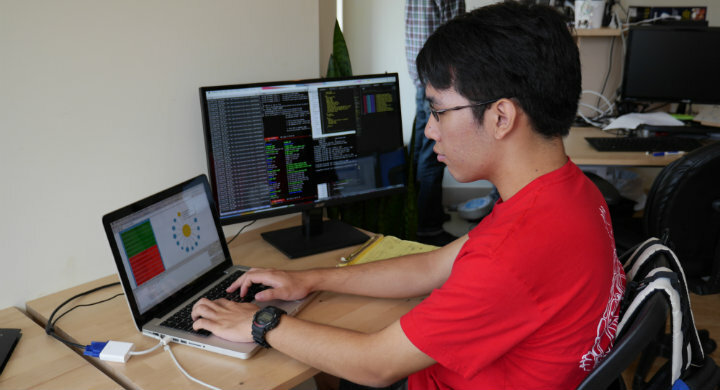 Before heading to College Park, he reflects on his time at TechChange as a Software Engineer – Analytics Intern where he worked on D3 data visualization projects to make online learning interactive. 1. How did you hear about TechChange? During the last fall, my dear friend Michael Holachek (a.k.a. “Code Ninja”), currently a rising sophomore at MIT, kindly shared his TechChange internship experience with me. While I was browsing through the TechChange website, I came across the job description of “Software Engineer – Analytics”, which is when I became first interested in working for TechChange. 2. Why did you choose TechChange to spend your summer before beginning college? After taking an online Machine Learning course from Caltech, I became really interested in not only how to use computational algorithms to find correlations in data, but also how to interactively visualize them in aesthetically pleasing ways that can provide hidden insights for the front-end users. TechChange’s job opening for the “Software Engineer – Analytics” quickly grabbed my attention because of the idea of being able to work in the cutting-edge web development environment, while learning principles of real-life software engineering practice. The fact that I will be contributing to the company that aims to promote social change, and educate the global community was also a big plus. I love physics and mathematics. In college, I plan on studying Electrical Engineering and Computer Science, the two subjects that I believe will let me apply my passion in physics and math into solving real-life problems. During my free time, I play piano, do Cross Country running and play Ultimate Frisbee. Also, I have a longstanding interest in modern European history, and I enjoy having discussions and debates with my friends on various thought-provoking topics such as political philosophy, epistemology, ethical dilemmas, and religion. 4. How did you use your TechChange internship to explore your interests? TechChange offered me a lot of flexibility in terms of what projects I worked on. While my main projects were developing front-end interactive D3.js (Data-Driven-Documents) visualizations, I also had opportunities to learn about SaltStack server provisioning automation, and work on small back-end Ubuntu server projects. Surprisingly, computer science wasn’t the only relevant subject in my work! I found my physics knowledge useful when I was working with D3 Force Directed Graphs, which used electric charge model and pseudo-gravity to compute the location of vertices of the graph until they reached the “electrostatic equilibrium”. My knowledge in discrete math and linear algebra also became invaluable when I was developing a social-learning matching algorithm to solve a combinatorial optimization problem that turned out to be similar to the Minimum weight spanning tree problem. 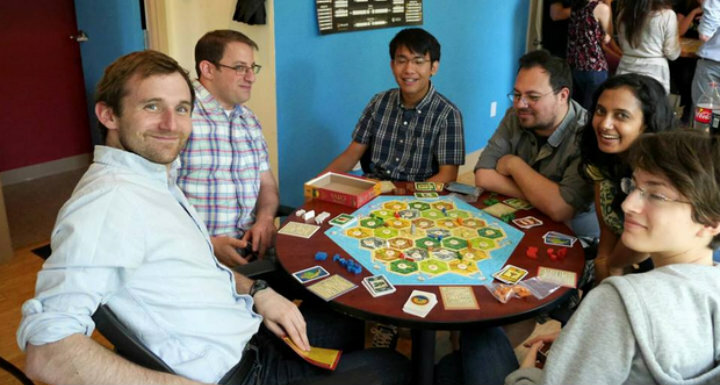 Apart from work, we had occasional TechChange Board Game days, World Cup cheering days, soccer/Frisbee team-bonding sessions and nearby park strolls that made my time at TechChange much more enjoyable and social. 5. What did you do at TechChange this summer? What was your role at TechChange? 6. What did you learn during your time at TechChange? 7. Did your TechChange experience end up going as you expected? I was expecting my internship experience to be mostly associated with computer programming. However, people at TechChange seem to follow the “work hard, play hard” philosophy. After working hard, we had times to socialize, play soccer and games together, which made my experience much more interesting. I was also surprised by how friendly and opened people were and how flexible the working environment was at TechChange. 8. Would you come back to work at TechChange one day? Why? I would love to! TechChange’s tight-knit community and energetic teams have magical power that draws people. Supportive and caring, yet productive, efficient, and techie team members make TechChange a fantastic environment to work on projects that create real impact in the real world. 9. What advice would you give to future TechChange interns? Search for opportunities: TechChange has many different teams that you can pursue many different projects in international relations, course facilitation, media/video productions, UI/UX design and computer programming. If you find someone else working on a project that you want to take challenge on, then just simply ask. Explore nearby restaurants: located right across the U Street metro station, TechChange HQ is located in the midst of many spectacular restaurants; there are many places to explore around in U street for lunch, from an authentic Ethiopian restaurant to gourmet falafel place and famous Ben’s Chili Bowl. Take the full advantage of the plethora of exotic choices and try exploring many ethnic food groups!